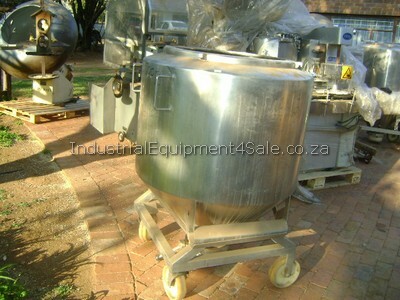 Pots For Sale: 1x 100 Litre Stainless Steel Pot for sale – R28,000 excl vat Make: Lab Jacketed pot, Capacity: 100 litre, Diameter: 460 mm, Depth: 600 mm, Single skin, Diameter: 390 mm, Depth: 480 mm, Capacity: 60 litres, On stainless steel trolley, Lids on both tanks. 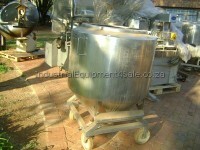 ————————————————- 2 x 500 Litre Pre-Owned pots for sale, Price – R8,000 excl vat each Stainless steel, Both pots are on wheels. 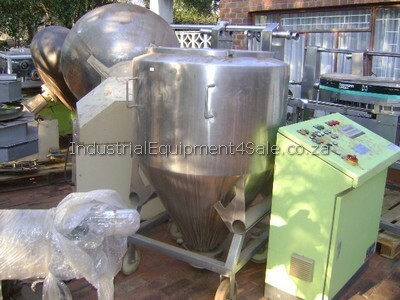 Conical shaped No stirrers included. 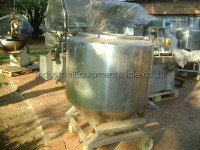 2 Stainless steel pots for sale,For viewing and collections – Ex Maraisburg, Roodepoort, Johannesburg. To confirm availability and for more questions, please contact us via call or by filling in your details and requirements on the righthand form. ryan@IndustrialEquipmentForSale.co.za Thanks, The Industrial Equipment team Mike – 082 4104012 www.IndustrialEquipmentForSale.co.za ………………. …………………..